Depending on variety Kalanchoe are grown for foliage or flowers, and sometimes both. Some varieties such as K. orygalis really are foliage plants, others such as K. blossfeldiana are grown for the flowers as well. This is a large genus of plants, most easy care and many readily available for sale online or at florists, where the long flowering nature makes them a popular plant. With over 150 species are one of the more ‘tropical’ looking genus of succulents that includes Kalanchoe thyrsiflora ‘Flapjacks’ with its fascinating oval leaves that form horizontal stacks, just like a stack of well… flapjacks. Lots of species and varieties available for sale including some rare and interesting forms. These are a frost tender plant, so protection is needed. With wonderful bright flowers right through summer they are great in pots indoors in a well lit situation. The most popular use is as container grown plants. they grow well in pots and are mostly very easy care and hardy. Some species are suited for growing in hanging baskets, while others grow well outdoors in the right climate. This is interesting group with some being annuals, others perennials and some small shrubs, so conditions will vary a little. It is not really possible to lump them all together, however a few general care guidelines can be followed. All species require lots of sun and good ventilation or air movement. They are not a frost tolerant group of plants. 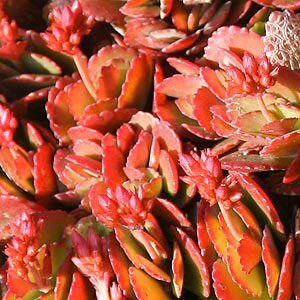 Although they are succulents, they do like some additional water when in active growth. Cultivation is not difficult if given warmth. Kalanchoe grow well in specialist succulent potting mix. In warmer climates in a frost free position you can easily grow them in the garden or in containers outdoors. In frost prone areas, container growing is best where they can be moved to a protected position as needed. K. beharensis with its silvery grey leaves will reach 30cm. Remember that species or varieties have different characteristic, some with felt like leaves and others with glossy foliage. K. tomentosa comes in a number of cultivars including ‘Chocolate Soldier and Golden Girl’. K. orgyalis has attractive bronze leaves with a silvery underside. In warmer climates try them outdoors in part shade. K. daigremontiana, or Mother of Thousands. K. gastoni bonerii ‘Donkey Ears’. K. delagoensis also known as ‘Chandelier Plant’ or ‘Mother of Thousands’.